You’d be hard pressed to find a symbol of New Orleans more loved and cherished than the Fleur de Lis. The Fleur de Lis says Louisiana and especially New Orleans to people all over the world. This iconic symbol has come to represent the culture, atmosphere and style of the Big Easy. Where exactly does this symbol come from? And how did it come to be such a big part of the quintessential New Orleans style? Its history is more storied and complex than many realize. The emblem is most likely based on the lily or iris. Historians believe the current style dates back to early France, placing its arrival at 1062 A.D. It has earlier roots in Babylonian times, and later become a traditional insignia of French royalty. Its association with France remains strong to this day. However, it did reach Great Britain and make its mark there as the feather fleur. While the Fleur de Lis was found on many coats of arms throughout European history, it also became a common symbol on flags. You’ll find it today on the flag of Quebec, Baton Rouge, New Orleans and the Franco-American Flag. The Fleur de Lis has been an integral part of New Orleans culture since the city’s inception. Settlers of La Nouvelle Orleans immediately marked the area with a Fleur de Lis flag. Look back on Mardi Gras invitations from the 19th century and you’ll see the symbol used as decoration. In present day, different variations of the Fleur de Lis can be spotted all over the city. Over time, it’s gone through many unique styles, each one altered to represent the vision of the artist. At Doors of Elegance, we offer a collection of doors inspired by the Fleur de Lis. This collection has many different options to choose from, making it easy to fit a variety of entryways, homes, and personal tastes. You’ll even find a half-moon style door with the iconic symbol displayed prominently in the middle. Each door adds a classic look to your home and lets you show a little Louisiana love right from your front porch. With our new special, you’ll have a chance to get that Fleur de Lis style you love at an incredible price. Reduced to $950 until October 31st, the classic 36 x 80” Fleur de Lis door is a must-have for any Louisiana or Louisiana-loving home. This door will freshen up your entryway in a snap and is sure to make you smile each time you enter. It, of course, pairs perfectly with other New Orleans themed decorations but makes a statement on its own as well. You’ll love the elegance it brings to your home thanks to the expert craftsmanship and unparalleled attention to detail. This is one opportunity you just can’t pass up. At Doors of Elegance, we pride ourselves on our commitment to quality and attention to detail. Family owned and operated since 1987, we offer wrought iron, French and carved solid wood doors. Our team also provides services like door refinishing, professional installation, and door weatherization to homeowners in the Louisiana area. 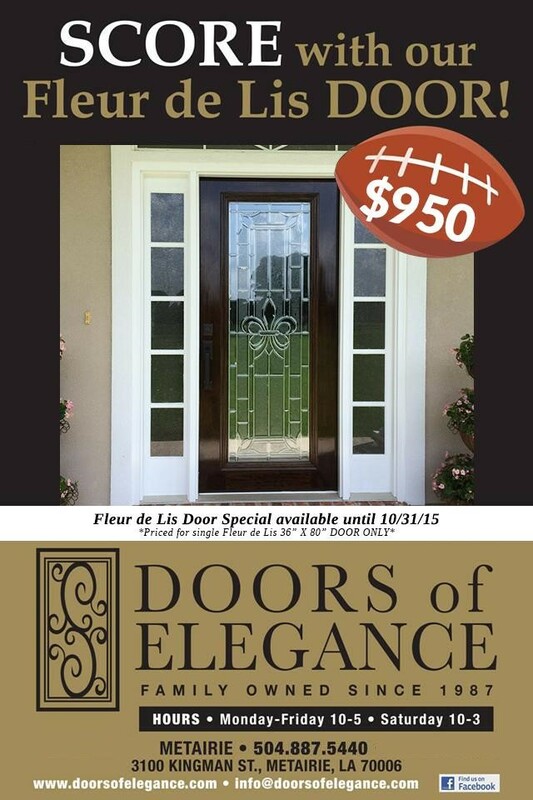 To learn more about Doors of Elegance and our Fleur de Lis door special, contact us at (504) 887-5440.